Mark Cox arranged this match to raise funds for the England disabled and ladies teams and worked really hard to publicise the event and getting loads of firms on board who gave generously for the raffle. 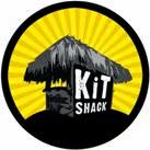 There was a real buzz around the match as more and more people put their names down for this very worthy cause including a certain Mr Des Shipp! There were over 60 names on the list at one point although a few dropped out before the big day which was a bit disappointing. 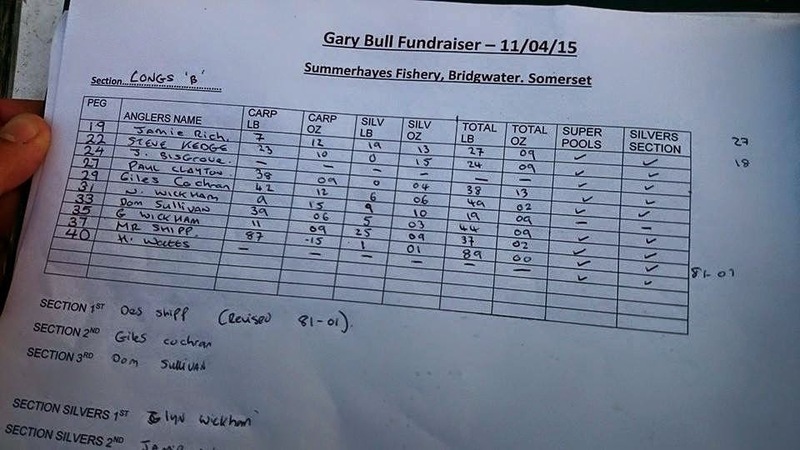 It was great to see quite a few anglers from Ilminster there with Robin Cox, Frank and Jake Woodard, Jamie Bisgrove and Steve Hurford all showing their support. 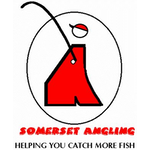 I picked Steve up and when we arrived the car park was already nearly full with more anglers turning up all the time. 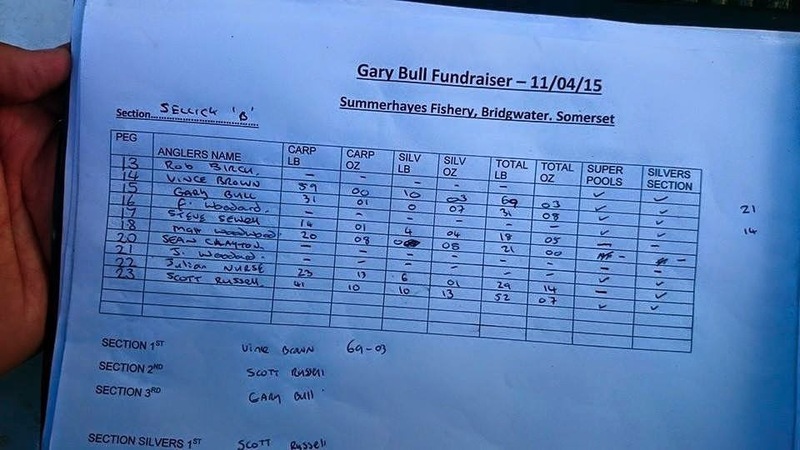 We collected our nets and paid our pools where I met fellow blogger, Lee Williams for the first time who was helping out with the organising, it was also really nice to meet Gary Bull who had travelled down to fish the match. Alongside Des and Gary, other stars included Alex Murray, Giles Cochrane and Vince Brown to name a few. The match was being held over three lakes, Longs, Sellicks and Lily with two sections on each of the first two and one on the latter. The payout would be the top three in each section with an optional superpool that would pay the top two silvers in each section and the top three overall. At the draw I managed to avoid Lily and pulled out peg 19 on Longs, it wouldn’t have been my first choice but I have done some decent weights of silvers from this area, the Tart was on Sellicks peg 4 which is a really good peg for carp and silvers, his mate Howard was on Longs peg 40 and Glynn was on Longs number 35, another great area. 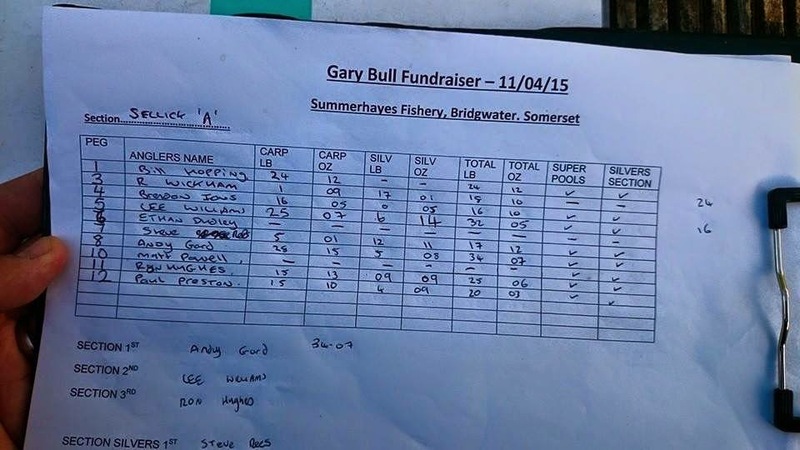 We all decided to put £2 in the pot and pay £4 to the top silvers and carp weights. 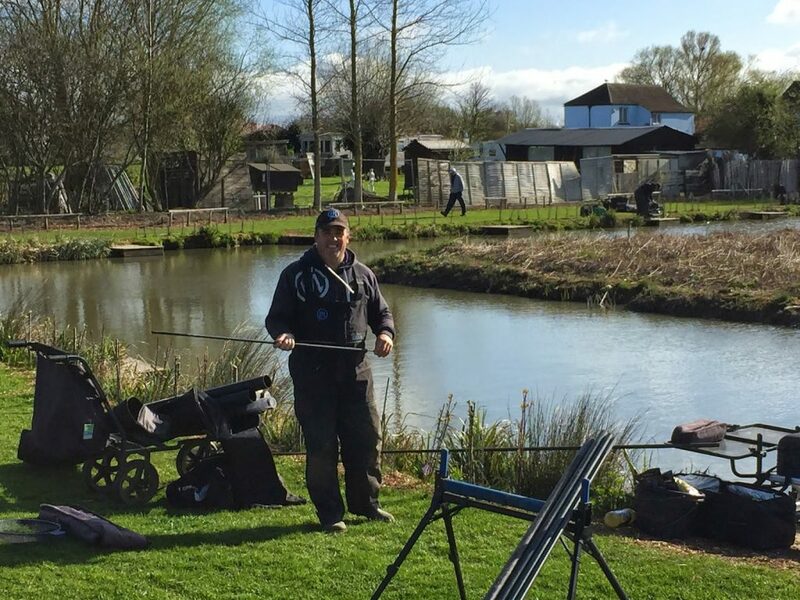 Des was on Longs on peg 37 and as he had quite a bit of space and was fairly sheltered he had to fancy his chances, despite it being his first match here! I think Des was happy with his peg! I got to my peg and was pleased to see the pallet on my right wasn’t taken and two empty pegs to my left, my nearest neighbours were Alex Murray on peg 17 on my right and Steve Kedge on peg 22. It was quite windy but not as bright as previous days which would hopefully help the fishing. I mixed up some groundbait and then set up two rigs, a 10 x 11 MW F1 Slim to fish at 10 metres and a 0.2 gram NG Mini Gimp to fish the shorter line at 5 metres. I plumbed up and the bottom was all over the place on the longer line and it took me a while to find three areas with the same depth. After Wednesday where I’d had problems with small fish using 4mm expanders I had some 6mm Bait Tech Jelly Pellets and also some hard 6mm pellets for banding. On the whistle I cupped in micros at 10 metres on the right and straight out and then two balls of groundbait on the left before finally potting in some micros at 5 metres. I went out on the right hand line and had a bite after a few minutes and hooked a carp, I had it pretty much under control (or so I thought!) when it had other ideas and did me under the pallet! I had to tie on another hooklength and plumb up again which wasted a few minutes but then my next bite saw solid resistance and I was soon netting a good bream. Any hopes of a bagging session soon disappeared when all I could catch on my three longer lines were tiny roach. Alex and Steve were getting odd carp but it was quite slow going at this early stage. I kept trying my different lines but all I could manage were two blades and a slightly better 4oz skimbob, Charlie Barnes on peg 15 was also fishing for silvers and it looked like he was struggling too. I tried a 6mm strawberry jelly pellet but although I could get indications I think a lot of it was small fish again, I did lose two foulhooked fish, one might have been a skimmer but the other was definitely a carp. Then out the blue I’ve had a decent skimmer from the line straight out in front and then not long after another good bream around 3-4lb but then my next two fish were carp. 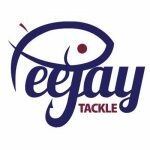 Alex was now catching well fishing to the island, Kedgy had slowed up after a good start and Jamie Bisgrove was struggling in peg 24 although he had caught a nice bream and a small carp. I had another carp but was going nowhere fast, there were blows over my 5 metre line so I put on a 6mm banded pellet, I started getting indications and then hooked and landed a slab that looked to be getting on for 5lb, and then a few minutes later I’ve had an even bigger one and there’s still thirty mins to go. Alex had switched to his inside line and was now bagging, getting a fish a chuck and would do a good weight. I was praying for a few more fish but time was running out and then with ten minutes to go the float buried and I’ve hooked a good fish only for the hook to pull out – bugger! I had a couple more indications but then time was called and that was that. As I was packing up, Glynn came down and said he’d had five slabs plus some other silvers so that last fish I lost could have been costly. With Pete not fishing today, the weigh in was soon underway and started at Longs peg 2 where Ryan Thomas had 26lb 10oz which remained the top weight until Paul Homewood in peg 14 had a level 30lb and then Alex Murray stormed into the lead with 64lb 12oz but would it be enough as apparently Des had bagged up with around forty carp and Vince Brown had done well on Sellicks peg 14. Then it was my turn and my three carp went 7lb 12oz before my four bream and four skimmers plus a few bits went 19lb 13oz but I was the first peg in my section which also included Glynn and I knew he’d beaten me. Giles Cochrane had 49lb 2oz from peg 29 before Dom came close with 44lb 9oz, then Glynn had 25lb 9oz of silvers so it would have been close if I’d had that last fish I’d lost. Then Des had a brilliant 89lb although as he was over in his carp net, this was adjusted to 81lb 1oz. So I’d finished second in silvers in my section (and on the lake) and should have an envelope to come. 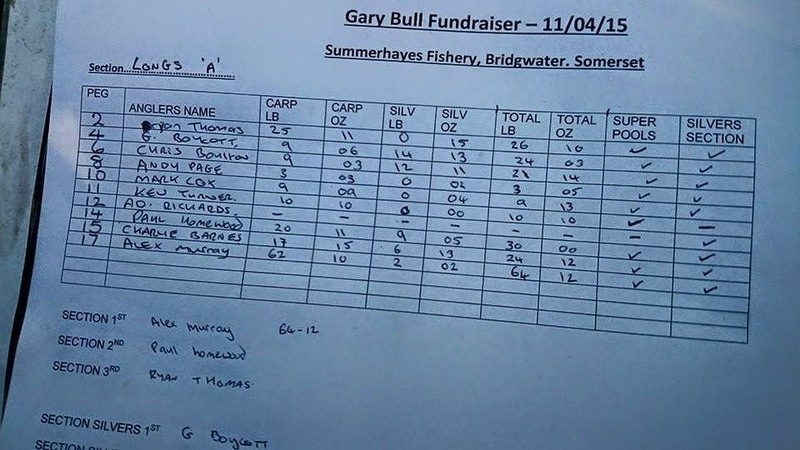 The scales then moved onto Sellicks and Ray had 17lb 1oz of silvers on peg 3 before Lee Williams had 32lb 5oz from peg 5 and then Andy Gard just pipped him to take the section with 34lb 7oz from peg 8. We then all turned right onto Lily and Bob Gullick set the pace with 42lb 7oz from peg 2 although he’d lost a few fish (and floats) in the lilies in the process, Gavin Jones had 36lb 7oz next door, Simon Hales went into third place on the pond with 32lb 15oz from peg 8. 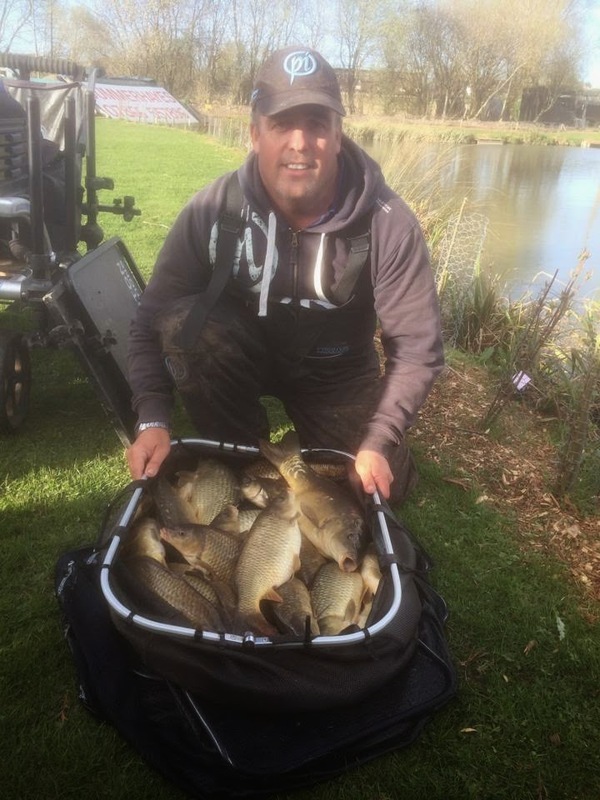 Back onto Sellicks and Vince Brown had 69lb 3oz from peg 14 to go into second place overall, Scotty Russell had 41lb 10oz of carp and 10lb 13oz of silvers from peg 23 for second on the lake and first in silvers and Gary Bull finished third on the lake with 31lb 8oz. 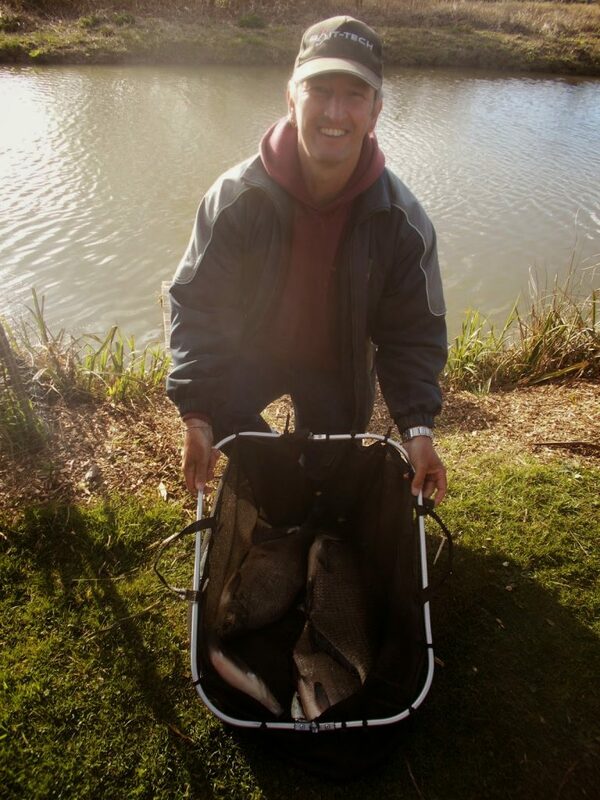 On the sidebet front Glynn picked up the £4 for the silvers and the Tart took our mini carp pool with 16lb odd. We all gathered for the results and Pete and Sally laid on free burgers and drinks which was a fantastic gesture. Before the prize giving we held a minutes silence to remember Clive and then Gary said a few words thanking everybody for turning up, which was nice. Lee and Mark did the results, I picked up £18 for second in the section for silvers which helped cover the cost of the day. 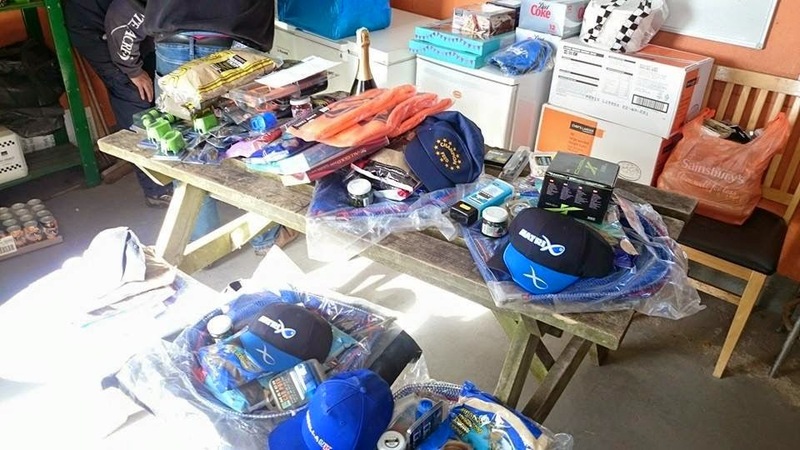 Then it was time for the raffle and there was loads of fishing tackle up for grabs, Hurf won twice and Jake and Rob’s numbers were also picked out so they took home some nice prizes. 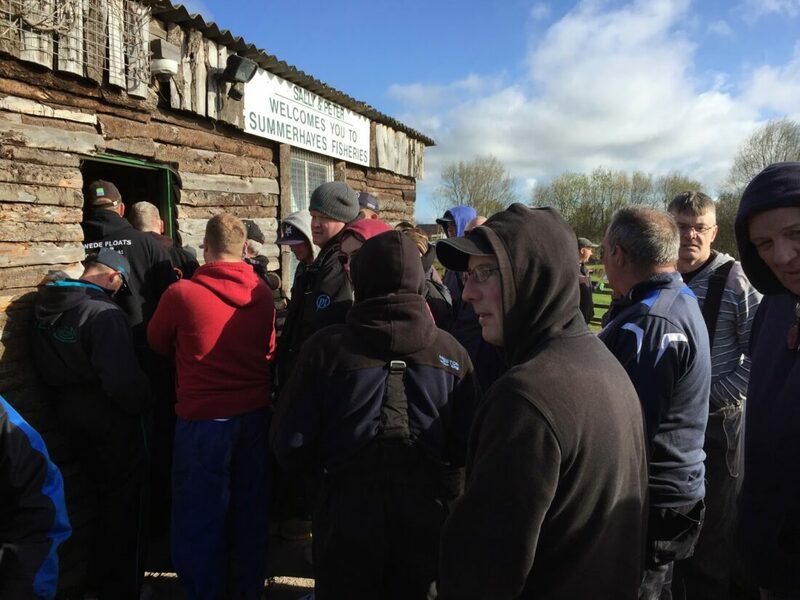 It was a really nice day, well run and organised by Mark Cox, Lee Williams and Norman Sterry – top work lads. 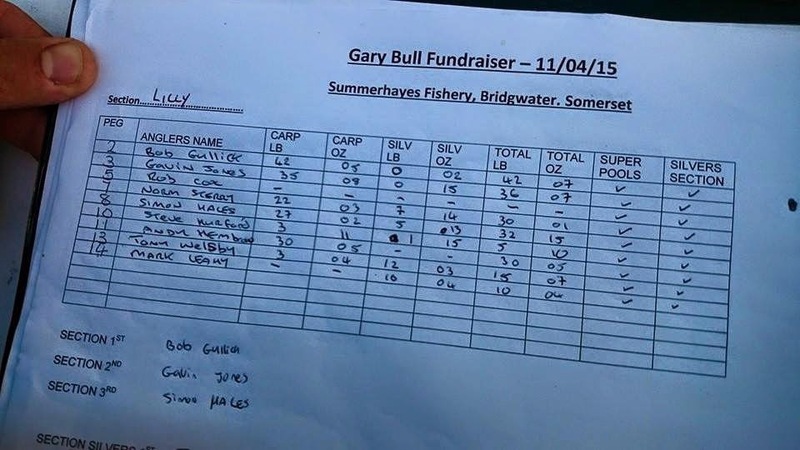 Pete, Sally, Adie Richards and Adie Bishop looked after all the anglers really well and everybody who supplied prizes were very generous and I believe over £530 was raised by today’s match, what a brilliant effort. Looks like Des hammered it!